Morton Bagot is a small village of scattered properties and farms. The old name of Mortone means the settlement of the moor and the Bagot element coming from the name of the Lords of the Manor, who added their name when they came into possession during the reign of Henry II. The parish Church of Holy Trinity is that rare thing; a simple 13th century village Church that has not been restored, but clearly is not neglected. The setting on the bank next to Church Farm is stunning. There are open views of the hills around, with earthworks clearly visible behind the Church. Holy Trinity is approached by way of a lych-gate erected in1936 by Cannon Warren, the then Rector. There are the remains of a post box set into an adjacent wall. Holy Trinity consists of an uncomplicated nave and a peaceful chancel with stone walls. Electricity and mains water have never intruded on the ancient stone. In the depths of winter the candlelight is magical and gives the services a very individual spiritual feeling. 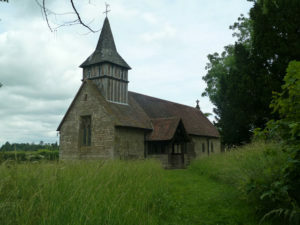 The Church has a small timbered bell-cote with old Oak beams containing two bells, still rung today. There are a number of memorials in the Church. Behind the Church there are earthworks which are believed to be the site of a castle or fortified Manor House. Traces of a moat near Church Farm may perhaps mark the site of a building described in the 17th century as Lord Carington’s Lodge House. The earthworks are listed as a Scheduled Monument. Oldberrow is a small rural hamlet that used to be part of Worcestershire until 1896, when it was transferred to Warwickshire. There is no village as such, only a collection of farms and houses and the three most notable properties, the Church, The Rectory House and the Court lie at the junction with the A4189. The name first appears in 709 A.D. when Kenred of Mercia gave 12 acres of land in Oldberrow to Bishop Egwin towards the endowment of his newly founded Monastery at Evesham. The name of the hamlet in the Doomsday Book of 1086 is Ole Bergh. St Mary’s Church at Oldberrow is another rare thing; a simple Church that is never closed, not for one minute of the year. This small and simple stone building is very welcoming and soaked in prayer. It was rebuilt in 1875, on the site of a medieval Church, at a cost that was largely borne by the then Rector, the Reverend Samuel Pershall who was Rector for 60 years and the 3rd generation of his family to hold that post. Fortunately many of the historic features have been reset in the present Church including a magnificent ancient font together with the 14th century South door. There are two stained glass windows in the Church which are dedicated to former Rectors. The East window is in memory of the Reverend Samuel D’Oyley Pershall, Rector between 1792 and 1859, and contains a piece of glass bearing the arms of Evesham Abbey. The West window is dedicated to Cannon Warren who became Rector in 1933. All of this is surrounded by what is commonly known as the best wildflower churchyard in Warwickshire. The Rectory House which is now named Oldberrow House lies almost opposite the parish Church of St. Mary’s. It was rebuilt in 1877 by the Reverend Samuel Pershall to become The Rectory House. He rebuilt the house in the Victorian Gothic Revival Style. It passed into secular hands in 1929. During the Second World War it was occupied by the Land Army and used as a hostel for the new volunteers. In November 1942 Eleanor Roosevelt visited the girls at their hostel. From 1950 until 2012 it was the home of the Smith family. Oldberrow House and the 37 acres of mature grounds are now used as an exclusive wedding venue and also offer luxury country escapes to those who wish to stay at a beautiful traditional English Country House. Oldberrow Court is situated opposite St. Mary’s Church on the other side of the A4189. It is a mid 16th century moated Manor House and is a Grade 2 Listed Building. The Court has been fully restored and is now used as private residence. Around the house are the remains of a rectangular moat, the North and West arms of it still contains water. Ullenhall village stands on the site of one of the settlements that were made in the clearing of the Forest of Arden. The original name was Ulla’s Nook, meaning a nook or corner of land, suggesting the hollow in which it is situated. It is thought that the village was at one time centred closer to the Old Chapel, with more houses at Deans Green, Blunts Green and Hall End. Ullenhall stands on lands that were originally part of the beautifully wooded Barrells Hall Estate. The earliest mention of the Barrells was a reference to a Richard Barel in 1405. In 1554 the estate was purchased by Robert Knight of Beoley and remained in the Knight family until 1856. The family crest was a winged spur which gives its name to the village public house. Another Robert Knight, Lord Luxborough (afterwards Earl of Catherlough) bought the estate from his second cousin in 1730. From 1739 to 1756, his wife Lady Luxborough lived apart from her husband, as she was banished to Barrells Hall following a romantic indiscretion, and made the house the centre of a famous literary circle. The Newton Family followed the Knights at Barrells Hall and extended the property dramatically. However, the house was very seriously damaged by fire in 1933 and lay derelict until 2005 when it was beautifully restored to the private residence it is today. There are two Churches at Ullenhall; the old parish Church which is known locally as The Old Chapel and the modern Church of St. Mary the Virgin, down in the village. By the mid-1800’s The Old Chapel was said to be in a dilapidated state and the parishioners were looking to have a new building closer to the growing village. The decision was made to save and repair the chancel at The Old Chapel and for it to be used as a Mortuary Chapel, the churchyard having been consecrated for burials in 1835. 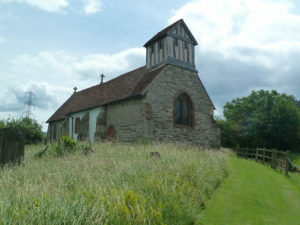 Previous to that time, Ullenhall burials took place at the mother Church in Wootton Wawen. Ullenhall became a separate ecclesiastical parish in 1861 and incorporated Aspley, Forde Hall and Mockley. During the late-1800’s four significant buildings were built in the parish by the three sons and two daughters of The Newton Family at Barrells Hall. These were the Church of St. Mary the Virgin, the Vicarage, the Village School and Teachers House and the Coffee House. The Church of St. Mary the Virgin was built to an odd idiosyncratic design by John Pollard Seddon in the Early English Style. It was paid for by the three Newton brothers of Barrells Hall in memory of their parents William and Mary Newton. The Church was consecrated by the Bishop of Worcester on Tuesday 18th May 1875. All the villagers were asked to attend, and after the service everyone in the neighbourhood were invited by the Newton’s to a luncheon in the marquee at Barrells Park. The Vicarage was built a short distance from the Church, to the left and over a field. It remained the home of successive vicars for nearly 100 years. In 1972 the ecclesiastical parish of Ullenhall was united with Henley in Arden and Beaudesert and The Vicarage, being no longer needed, was sold, demolished and replaced by the two current properties. The old Village Schoolroom and adjoining Teachers House was built in 1876 and was to be found almost opposite the public house. The school eventually closed due to falling numbers and the buildings and land sold for re-development. The Teachers House has been modernised and extended and is now a private residence. The Coffee House opened in 1883 and was the earlier version of the Village Hall. It was the meeting place for village activities and refreshments and the venue for the Village Club. The purpose built Village Hall on the Henley Road was opened in 1935 and replaced the Coffee House. It is one on the nicest Village Halls in the area. 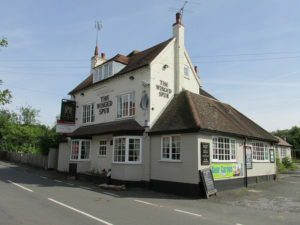 The Winged Spur Public House can be found on Ullenhall Street in the centre of the village. The Ullenhall War Memorial can also be found in the centre of the village, outside The Old Central Stores, now a private residence. There is a small car parking area opposite the Church of St. Mary the Virgin.